Snakes often endure illness stoically, without exhibiting obvious signs or symptoms of illness. Accordingly, it is important to notice the very first signs of illness and act swiftly on your pet’s behalf. If your snake is wheezing or making noises when it breathes, it may have a respiratory infection or parasites, which necessitates prompt veterinary attention. Wheezing, labored breathing and discharges can indicate that your snake has an upper respiratory infection. The causative organism can be viral, bacterial or fungal, which can cause serious illness or death if left untreated. 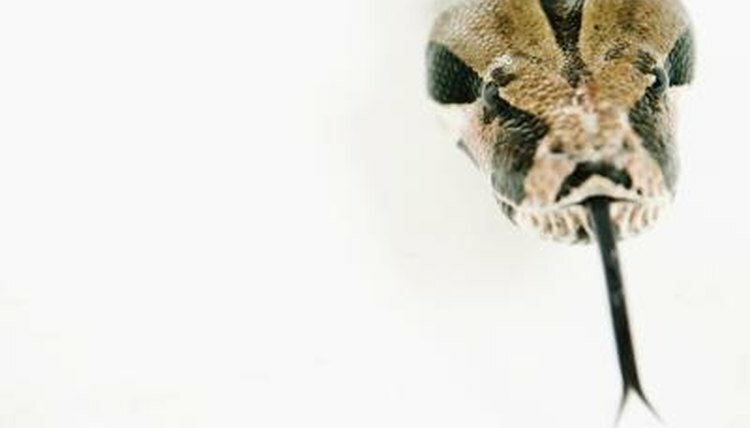 Sometimes, contagious pathogens acquired from other snakes are to blame, illustrating the importance of strict hygiene and quarantine procedures. Other times, snakes develop infections when ubiquitous bacteria overwhelm their immune systems. This usually occurs when snakes are severely stressed or don't have access to the proper temperature or humidity. Parasites sometimes infect the breathing passages of snakes, causing wheezing or labored breathing. Worms of the genus Rhabdias are one group of parasites that inhabit the lungs of snakes. Pentastomids are another type of parasite that lives in the respiratory tract of snakes -- pentastomids may infect humans, so use strict quarantine and hygiene if they are detected. Snakes often wheeze or make a clicking sound when they are about to shed. This is no cause for concern, and will go away shortly after the snake sheds. Snakes that continue to wheeze for more than a day or two after shedding should see a veterinarian promptly. It is often helpful to soak snakes in about 1 inch of lukewarm water for a few hours each day while they are preparing to shed. This will help ensure that they are properly hydrated and can shed properly. If your snake is wheezing, you should take it to a veterinarian as soon as possible. Your vet will perform a physical examination of your snake, discuss its husbandry, take throat or nasal cultures and potentially draw a blood sample. After examining the cultures, your vet can identify organisms that are causing your pet’s illness and prescribe medications to help. At this time, you should examine your care practices to ensure you haven’t contributed to your snake’s illness. Keep its housing temperature and humidity at optimum levels and provide a hide box for relaxation. Don’t handle your snake any more than necessary until it has fully recovered.